Member of popular J-Pop boy band Hey! Say! JUMP since 2007 until present. Yuuka Dec 11 2018 12:34 pm I want to see him more drama Chinen is my ichiban? tyas Nov 23 2017 8:16 am You are the man of my dream, the love of my life... I love you! chiiiiiiiiiiiiiiiiiiiiiiiiiii Nov 11 2017 5:37 am please give chinen a drama series project ._. kuro Oct 01 2017 8:57 am i have seen you grow up (tho your height never did but i still love you) and i am so proud of what you've become. i will always support you and the whole JUMP. you are always be our baby. and if someday you decided to commit (tho you said wont) i will be happy to see you take that step in your life. i will be happy for you (i will be happier if you date Umika tho lol). Forever Yours Nov 09 2016 9:58 am Chinen-chan! I hope I'll get to meet you someday. Wait for me okay? Daisuki! pochi~ May 28 2015 12:10 pm Its been a while since I last saw your dramas ,mv,and pictures...i still cant get over you:')...even if i have bf now...:')..i still admire you...your cute smile and your eyes:')..hoping that someday I can meet you in person...im your fan since 2008:').. i see some of your characteristics to my bf :')..that's why I really like him so much ..as much as i like you:')..take care:')..
Miyako May 09 2015 7:03 am I want to see him take a mature role, not just a typical high school ikemen. Although because of his height and cute face, he always gets stacked with high school roles. 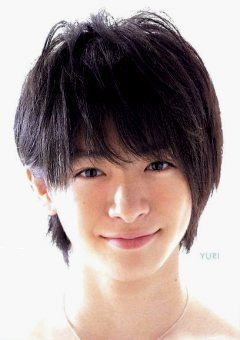 Anonymous who loves Yuri Chinen very much! Mar 07 2015 9:06 am Chinen-san, I want to meet you someday, please wait for me! perrinpandora Feb 12 2015 10:26 am Chinen is definitely the best! He's my ichiban...! Chinen is awesome, kakkoi, kawaii and he looks like the cutest squirrel (well, that's what people say... but he's so cute, anyway!) Can't get enough of seeing his face, though. ani nadezhda Apr 19 2012 9:37 pm cutee , smart but also sharp ! ! whatta combi...! Rika Aug 01 2011 2:26 am This cutey~! Hehe, he ran around in his briefs in Nin x Nin xDDDD. He was super cute! & he still is :D ! hanna Jul 15 2011 5:28 am chii~~ <3 stay cute! but please try being cool sometimes! hahahahha aishiteru!!! i <3 u choo much..
jaike ramos Mar 09 2011 3:38 am chinnen yuri kawaii!!!!!!!!!! jaike ramos Mar 09 2011 3:38 am kawaii!!!!!! archilyn Feb 16 2011 4:41 am ..the most lovely guy i've ever seen...yuri-kun is soo kawaiii~~ ..i really love that guy!.. mizuki Dec 14 2010 8:47 am the cutest guy I've ever seen.. this is the first time that i really got hooked with celebrities.. I'm more interested in manga and anime after all.. but I took a liking to celebrities because I heard this boy's voice.. I was like O.o! how can his voice be so high? was what I was thinking.. anyway, ganbarre Chinen-kun.. your fans will always be here for you! noinubro Jul 03 2010 8:51 pm wa..... so cute/cool... don't change, kay?